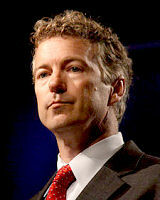 On Tuesday, Rand Paul was a guest on PBS' Lehrer News Hour, and he answered questions well. Do read what he said. He was elected Senator from Kentucky, and founded the Tea Party caucus in the US Senate. Asked about the Obama budget, he replied that it seemed to be a very long way divorced from reality. Among other sound stuff he observed that even if all "discretionary" spending were competely eliminated (and nobody is even proposing that - not even Paul) it would still not balance the Federal budget, and therefore still increase its already nearly impossible debt burden of $14T, which is as much as the whole economy produces in a year - and a great deal more than that if the half that government produces were valued realistically instead of "at cost." In other words, the FedGov is completely broken, but will not admit the fact. That night, I had a dream. Like most dreams it was not rooted in reality, for it imagined that the FedGov did admit that fact and then took rational appropriate action - namely, to go out of business. Of course, they won't do that, because the purpose of power is power, and they will use every last ounce of it to maintain power. All the same, it was a neat dream. Voluntary liquidation is what a company does, when its business model is no longer viable. A coal mine, for example, has scoured out all the coal in the seam and, after 40 years, can produce no more; it's time to wind up, settle outstanding contracts, and maybe sell off a few assets. A mistake was made; years before when business was brisk, the end of the seam was predictable and at that time the firm should have diversified so as to survive this day; but the owners didn't, so now it must dissolve. My dream imagined the effect of dissolving the FedGov. $774 billion a year (here's the link; jump to page 97) would no longer be spent creating foreign hostility where none would naturally arise, so the end of the DoD would make us all more secure; no more suicidal wackos would have motive to kill us. $1,200 billion a year would not be spent on "social security", so we oldsters would have to get back to work, or appeal to our children (who might well provide help, being no longer forced to do so) or to charity, or else suffer the natural consequence of having voted for a known Ponzi scheme all our working lives. $1,300 billion a year would no longer punish the hardworking, reward the idle, and distort society and its business with "social programs and community development," so leaving the market to work efficiently; and $70 billion a year would no longer be spent enforcing massive injustice. That would leave $176 billion a year to be saved by abrogating the debt, so stranding all who were so dishonest as to lend money in the sure knowledge that both interest and principal could be paid only when the borrower stole the money. All figures are from 2009; they are quite a lot bigger now. This dissolution would solve half the problem, so would massively boost prosperity; only State and local governments would remain to litter the landscape and many of those, being equally insolvent, would quickly follow suit. But it was a good start, and quite enough for a single dream. Reality? - all this will happen, and more, but only when government has no option because all its staff has quit. And they will quit only when everyone has been taught the nature of what it really is; and that will take us a few more years.